Fidelity’s Gavin Baker has made the most of the stock market’s recovery since 2009, and his long-term track record is compelling. This was a hard year to either make a killing or to lose your shirt owning a mutual fund. Still, the overwhelming majority of mutual funds that invest in domestic stocks and bonds put money in your pocket in 2014. So there were lots of potential candidates for this year’s Boston Capital Mutual Fund Manager of the Year, my ultra-subjective annual award recognizing a local investment manager. From them, I chose Gavin Baker and his $12 billion Fidelity OTC Portfolio fund. To some degree, Baker was in the right spot with a portfolio that tilted heavily toward stocks of big technology businesses, as the market this year favored large companies over smaller ones. Fidelity OTC was well in front of the pack: Over the past year, it ranked among the top 2 percent of more than 1,700 mutual funds that invest in US large-growth stocks, according to Morningstar Inc., the financial data company. So far this year, Baker’s fund has earned about 17.2 percent with a very concentrated portfolio. About half of the fund’s money is invested in information technology, and its top 10 stocks account for more than 40 percent of assets. Baker wasn’t my choice simply because of his performance in 2014. He made the most of the stock market’s recovery since 2009, and his long-term track record is equally compelling. Over the past five-year period, Fidelity OTC ranked among the top 2 percent of large-growth stock funds. Baker had the very good fortune of taking over his fund near the bottom of a historic bear market in 2009. There was no place to go but up, and that’s exactly where Fidelity OTC headed. And over that period, the fund earned an average of 19.8 percent a year. It outpaced one of the market’s hottest benchmarks, the Nasdaq Composite index, by about one percentage point a year. Baker has been investing his fund with big technology themes and a long-term horizon in mind. He’s built up large holdings in companies he thinks will be leaders in key technologies for many years to come. Like what? Baker cites products and services such as cloud computing, Internet advertising, e-commerce, personalized medicine, and artificial intelligence as examples. That focus — and the search for leaders in those fields — explains much of the concentration of investments in Fidelity OTC. 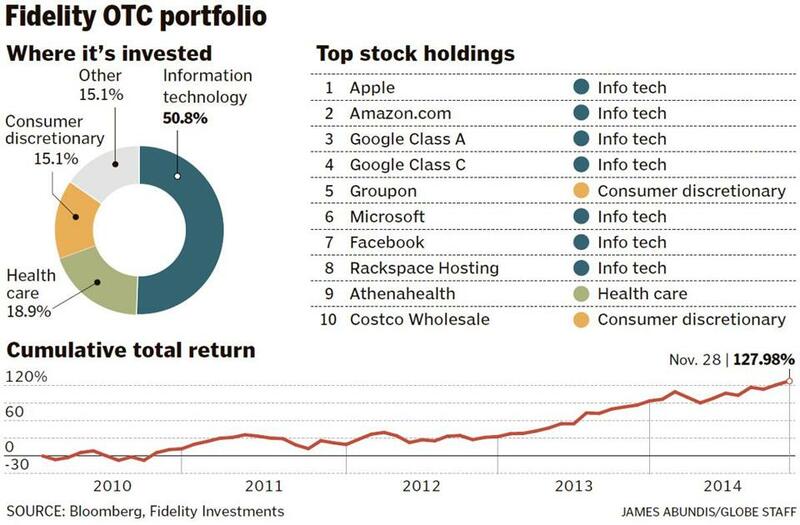 The fund’s top stocks are in the middle of one or more of those areas, including Apple Inc. (artificial intelligence, among other things), Amazon.com Inc. (e-commerce and cloud computing), Google Inc. (Internet advertising and artificial intelligence) and Microsoft (a company that attracted Baker with a new focus on cloud computing). Most of those stocks paid off this year. Eight of Fidelity OTC’s top 10 holdings have gained ground, led by Facebook Inc., up 46 percent, and Apple, ahead by 42 percent. The two losers: Groupon Inc., which has slipped 30 percent, and Amazon, which has shed 22 percent. In a conversation with Baker last week, I brought up the fund’s concentration and the risks it could pose to investors, given the history of the fund — it lost 46 percent in 2008 (during the market’s darkest year and before he became its manager). He insisted it wasn’t an issue. Baker joined Fidelity straight out of school, working his way up as an analyst and, later, as the manager of a smaller sector fund. That career track would not have been obvious while Baker was an undergraduate at Dartmouth. At that time, he imagined a future working on ski slopes in the winter and as a river guide during the summer. He even tried it out his junior year as a kind of ski instructor/housekeeper. “I literally cleaned thousands of toilets,” Baker said. Not exactly money management training. But his parents — the ones with lots of their money in Fidelity OTC today — insisted he try at least one professional internship. In the late ’90s, Baker ended up working for the bygone brokerage Donaldson, Lufkin & Jenrette in Boston and caught the stock market bug. Now, 15 years after he joined Fidelity, Baker has assembled a portfolio of stocks he believes will be winners for many years to come. “I want my fund to own the companies inventing the future,” he said, borrowing a line from Google chief executive Larry Page. 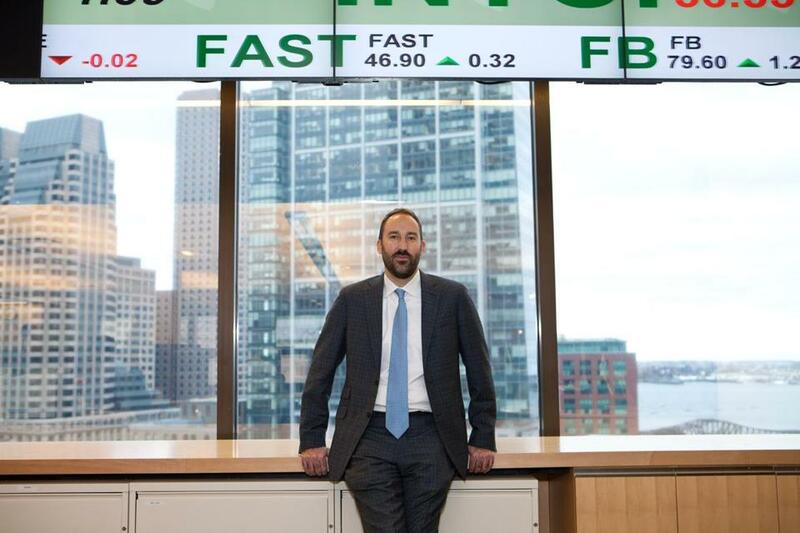 But he’s Boston Capital’s fund manager of the year for his work in the here and now.